At the age of 18, many others would feel that they are probably too old to pursue their dreams in music. But that was not the case for Coach Michael, a music learner who started off his music learning journey at 18 with zero music background. He has now evolved into an accomplished performer and coach! 1) We understand that you were a guitar student turned coach! Could you share with us a little more about this amazing journey? The journey started when I was 18. I was a total beginner in music back then and wanted to choose a music school to learn the guitar. At that time, my brother was learning the pop piano in Hark Music and he recommended me to learn in Hark Music. Since then, I have been practicing the guitar every day even until today! 2) When did you decide to play the guitar professionally? It started when I joined the Hark Performing Team after learning in Hark Music for a year. I started off as an amateur guitarist and would volunteer to perform whenever there was an opportunity. Since then, I was exposed to numerous performing opportunities and gained valuable experiences. After accumulating more experiences over the years, I was then approached by Hark Music to be a coach. 3) Has anyone discouraged your decision in being a musician as an impractical one? What would you like to say to them now? Yes, especially my family. However, they’ve stopped asking, when they realised I was having a steady stream of income from my teaching and performances. 4) What do you enjoy most about being a guitar coach? I enjoy it because I can share my knowledge & passion with my students. I hope I can nurture my students to be a professional and hopefully become a coach at Hark one day! Most of my students started learning with zero knowledge in music. When I see them performing during their student breakthrough performance, the sense of satisfaction is awesome! 5) What do you love most being a part of the Hark Music family? Everyone is fun here! It’s a place whereby I can find people that share the same passion. 6) Who is your favourite guitarist and how has he/she inspired you to become who you are today? My favorite guitarist is John Mayer. I feel that he totally redefines the way how I thought the guitar should be played. His techniques, guitar solos and voice are amazing! 7) What would you like to share with others out there who have the same goals of becoming a Musician? It is tough being a musician, especially in Singapore. Apart from having the discipline to practice daily, most musicians also need to deal with the initial stage of not having much income. However, if you truly aspire to be a musician, I would say just stay true to your passion. 8) What are the 3 most important music apps that every musician should have? Songbook. An application where you can get your guitar chords. Tempo slow: It allows you to slow down the song to practise. Metronome: The most neglicted yet crucial application to practise on your tempo. Every guitar sounds and feels different. I have tried guitars which are way more pricier than my current guitar but I still prefer mine. It’s just like my wife, no other woman is comparable to her! 10) If you had a choice, would you still have chosen the guitar as compared to other music instruments? Why? Perhaps I will choose the piano! I feel that the piano can impress (girls) more than the guitar? Haha! 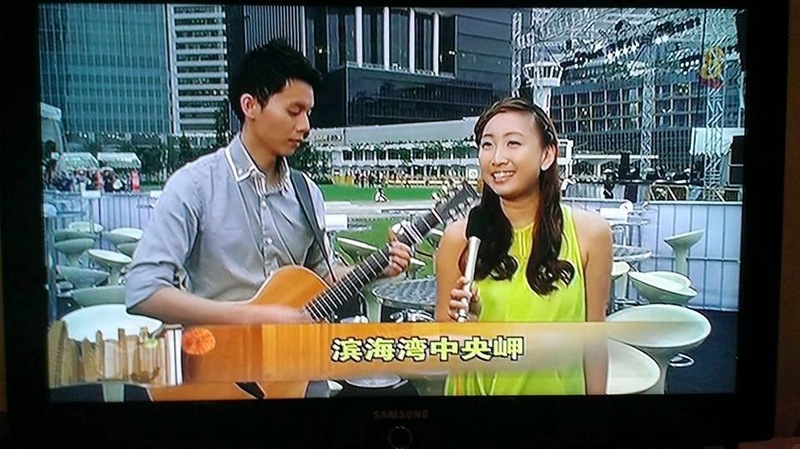 Check out this video of Coach Michael playing the guitar for local singer Chriz Tong as she sings this medley of her own songs!